The long cold winter months and lack of sunshine are often blamed for bouts of short term depression and Seasonal Affective Disorder SAD and are thought to be partially attributed to a lack of serotonin, a neurotransmitter that is associated with feelings of well-being and happiness. 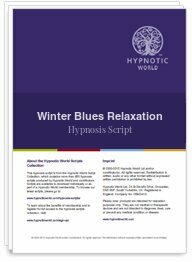 Evidence has also linked a delay in the patient's circadian rhythms with winter blues, SAD and related disorders and this hypnotherapy script uses visual imagery based on helping your clients to adjust these rhythms in the control centre of their mind. As we know, the autonomic nervous system controls temperature, heart-rate, breathing and many other bodily functions and when we change our thoughts to positive ones, this can also help make us feel better (just as many us of automatically feel good when thinking of a long awaited holiday).